Adolf Hitler committed suicide as his Third Reich collapsed around him. He was never tried for his crimes against humanity. The only time Hitler ever was on trial was after his unsuccessful coup in 1923. Then, he managed to beguile the judge and German public opinion and only received a sentence of five years for the minor crime of trying to overthrow the government. Even so, he only served nine months of his sentence. What if Hitler faced a judge who could not be beguiled by charm, sophistry, or histrionics? What if Hitler had to account for himself before a judge who knew Hitler better than he knew himself and could see through any lies or justifications? What is the man who preached war and genocide had a face-to-face discussion with the Prince of Peace? What would the Lamb of God and the Fuhrer of Nazi Germany have to say to each other? 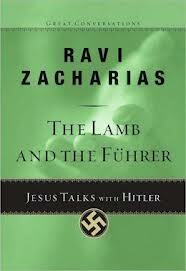 These are the questions that Ravi Zacharias seeks to answer in The Lamb and the Fuhrer. Like his other books, The Lotus and the Cross, and New Birth or Rebirth, Zacharias presents a conversation between representatives of differing worldviews. In this case, Jesus Christ questions and ultimately judges Adolf Hitler. It is a short, little book but very profound and I do believe that Zacharias did an excellent job imagining how Hitler might seek to justify himself before Jesus. Dietrich Bonhoeffer makes an appearance as a sort of witness and the discussion between Hitler and Bonhoeffer over the morality of the pacifists’ attempted assassination of Hitler is interesting and illuminating. I do have one or two quibbles. First, this is a very short book, only about 90 pages in print, yet the price is $10.99, which seems a bit steep. Secondly, the end was not as clear as I would have liked. Hitler asks about repentance and whether he would have been forgiven if he had repented just before his death. There seems to be an implication that he would be forgiven but then he is condemned. I think Zacharias ought to have made it clear that Hitler, being the person he was, could not have sincerely repented for his sins and was justly condemned. Despite these minor flaws, I greatly enjoyed reading The Lamb and the Fuhrer. This entry was posted on July 26, 2013 at 7:19 pm and is filed under Books I've Read, Christianity, History, Religion. You can follow any responses to this entry through the RSS 2.0 feed. You can leave a response, or trackback from your own site.